Birds are chirping. Flowers are blossoming. The sweet smell of Pinot Grigio is lingering in the air. (Just me? Weird.) Hallelujah, patio season is here. 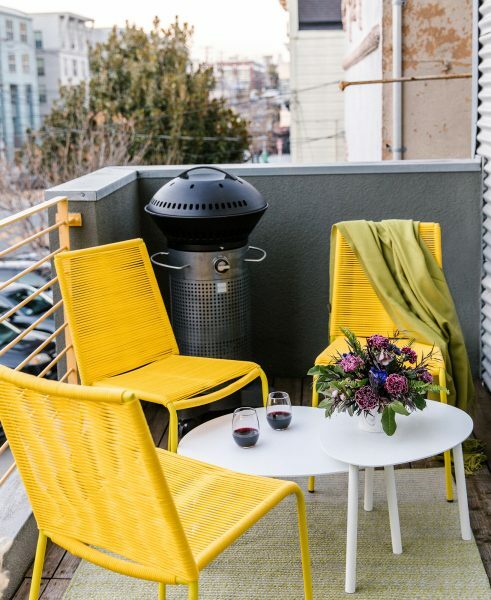 Bring on the sunset barbecues, the candlelit dinners alfresco, the rain-stained, off-kilter patio chairs … gah! 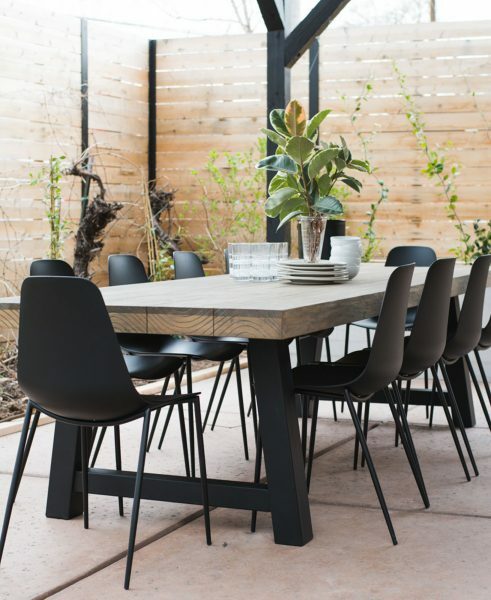 Whether your patio set excavation brought with it a few unsavoury surprises or you’re just looking for a few fresh pieces, you’re ready to figure out how to decorate your patio. Before you begin choosing outdoor furniture, you’ll have to make some decisions. Fashion or function? Outdoor lounge or patio dining? Soothing sanctuary or vibrant conversation starter? You’ve got choices, choices, choices. 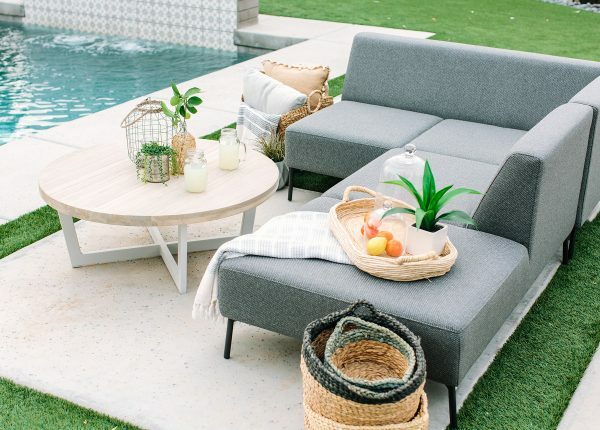 We’re here to help you make your patio — whatever the size — into an outdoor living space that you can party, relax, entertain, or all-of-the-above in all summer long. The Aeri lounge chair and the Urba table looking picture-perfect on Vintage Revivals’ blog. Ever been scorched by a patio lounger? Or felled like a tree after a warped chair leg gave way? Certain climates are hard on materials and bottoms alike. Rain can lead to rust, rot, and mildew. Sun and UV exposure can lead to fading and warping. (RIP plastic patio sets, everywhere.) Temperature swings can lead to cracking. The furniture you choose should match your climate. Here are a few tried-and-true materials we use at Article that endure for summers on end and age gracefully while they’re at it. Polypropylene. Polypropylene takes whatever the elements throw at it with a smile. Rain? Off a chair’s back. Dirt? It’s durable and easy to clean. Sun? Polypropylene is UV resistant and won’t crack. If you’ve chosen a colorful polypropylene piece, simply move it into the shade when you’re done to preserve its vibrant pop. Wood. Hardwoods like teak and acacia are an excellent choice for all climates. Acacia is a particularly sustainable and eco-friendly choice since acacia trees are abundant to the point of being invasive. Sturdy and robust teak naturally resists decay and water. Durable and beautiful, both gain character with age, developing a silver patina over time. Steel. Steel is extremely durable so it’ll survive temperature fluctuations unscathed. Usually, steel furniture is on the heavier side, which is excellent news if you’re living in a windy area. With some added primer, high-quality steel withstands precipitation, rust-free. Aluminum. Aluminium is strong, durable, and weather-resistant on its own. When paired with a polyester powder coating, it combats weather like the lightweight champion it is. Aluminum is a non-ferrous metal so its impervious to rust. Take that, rain. add some texture to your outdoor decor. The No Whey Lady incorporates the slouchy Esta lounger, fluffy Lanna pillows, and a cool blue throw with easy aplomb. Economy of Space: Consider Your Use. This is us, keeping you practical. Focus on pieces that allow you to maximize your patio-time. If you know you love to read your book on a cozy chaise, that’s where to focus your budget. If you have not-so-secret ambitions to become a BBQ master, prioritize a dining area over a daybed. What if you want it all, but your patio is on the smaller side? Pair a cafe table with two lounge chairs so you can dine al fresco and kick-back a la mode. A pouf is always a great addition because it doubles as an extra seat or a footrest. Small spaces require big ideas, so feel free to get creative. At Article, we’re making furniture that is convertible and multi-purpose. Our Kezia modular sofa might look like a sectional. But it morphs into everything from a deck chair, to seat with a side table, to a standalone coffee table. You *can* have your outdoor sofa and a deck chair too. If you have the luxury of square footage, you don’t have to be quite so laser focused. Consider divvying up your yard into sections, so it’s not one large block. Think about your home’s main floor. Your outdoor space can have a similar flow. Build a dining area for burgers and cards and a living area for moonlit soirees. Another hot design tip: group functional spaces together with a rug or a bold feature like a fire table. 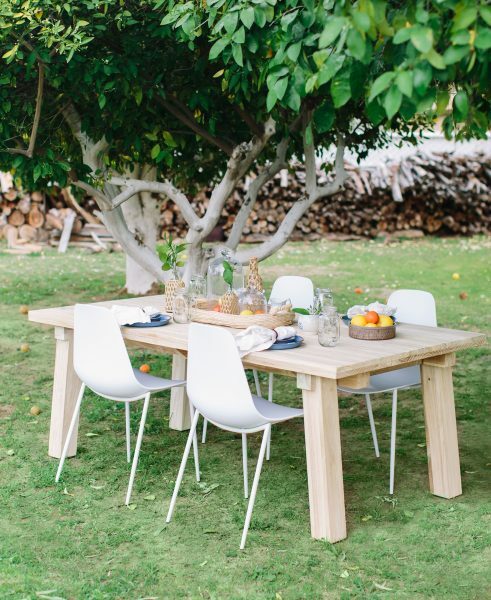 We’d like a brunch invite to AveStyles‘ beautiful, brunchable backyard. The Teaka table looks beautiful paired with the Svelti chair in crisp, cool white. Set the Mood: Ambience and Lighting. Candlelight is romantic but if it’s your only source of light, get ready for awkwardly intimate encounters when your neighbors pop by. Give your patio evening hours with some strategically placed lighting. Light not only keeps the conversation flowing once the sun goes down, but it also makes your patio more accessible to all your guests. There are three types of outdoor lighting to consider. Ambient lighting sets the general light level of your outdoor space. You’ll see ambient lighting in the form of pot lights, hanging lights, and post lights. Task lighting covers safety and security by illuminating pathways and doorways. It ensures mom and dad make it from lounger to bed without tripping over the doorstep. Accent lighting ties your overall aesthetic together. It’s the pendant lamp over your dining table; the string lights over your sitting area. Think low but lovely. Accent lighting is what makes you want to stay outside until the sun comes up. Good lighting is especially important when you’re (over) serving sangria, so strive for a balance of all three. We love how the No Whey Lady brings splashy color (thanks, Zina chairs!) to her small outdoor space. They look great next to the cool and understated Nebu tables. Tie it All Together: Choose a Theme. Some wicker here. A little plastic there. Tiki torches, everywhere. (Or not.) Patios aren’t always a decorating priority. As such, your pieces can become a little mismatched. Our advice? Choose a theme. It’s the best way to weave a feeling into a space, while achieving consistency and harmony. To choose a theme, go back to your primary use. Are you creating an energetic and colorful social space? Or do you crave a light and airy sanctuary? Ask yourself how you want to feel when stepping out onto your patio. For further inspiration, explore themes by color palette (like naturals), by culture (like Scandinavian), or by concept (like modern). Now, a theme doesn’t have to bang you over the head. For the sake of longevity, it shouldn’t. Bohemian, for example, could mean wild, fluorescent rugs, an overwhelming amount of throw cushions, and more poufs than a Moroccan market. But that could get old fast. Focus on a theme that will carry over each season. Make your boho style evergreen by choosing pieces that use earthy tones and natural materials. Still hungry for a splash of hot pink? Reserve any bold statements for accent pieces. Future you will thank you. Just looking at this beautiful scene by AveStyles makes us feel calm. The Tezra modular sofa looks gorgeous with the Toba coffee table. Pick a Chair, Any Chair: Outdoor Seating. 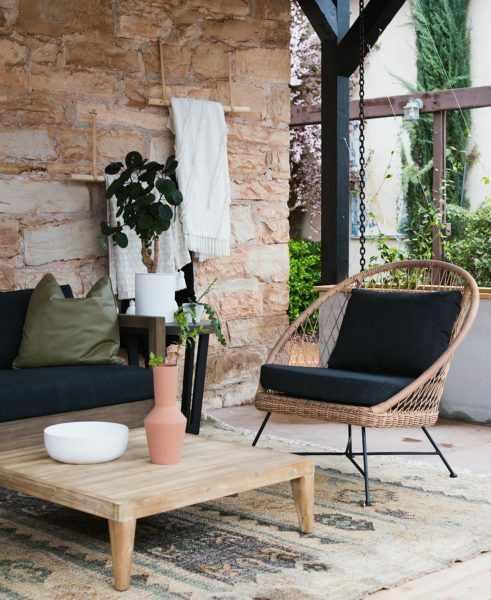 Good seating can help make your patio a place you actually *want* to relax. If you’re looking to upgrade your outdoor space, but don’t quite know where to begin, consider investing in seating. Chairs bring a sculptural element that elevates your existing pieces. From modular sofas to all-weather couches, we’re designing seating so comfy and stylish that your outdoor space can function exactly like an indoor space with more birds and sunshine. Who needs walls anyway? Turn your patio into an outdoor living room with a cushy sectional and an adjacent, equally cushy chair. (We’ve mastered the art of the outdoor adult bean bag chair. See ya later, hammock.) 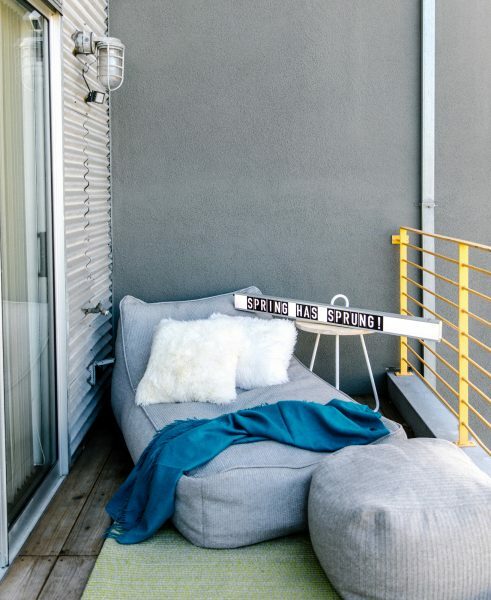 If sunshine snoozes are your jam, embrace your inner feline with an outdoor daybed. 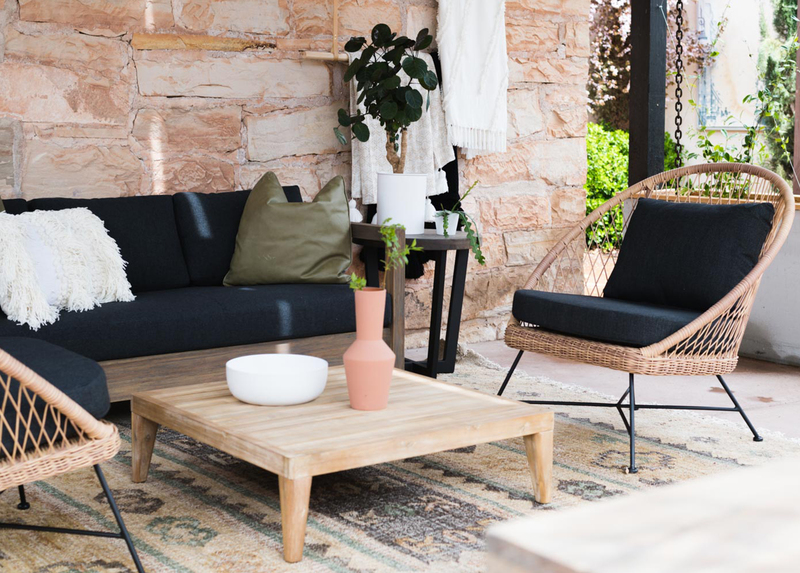 Midday siestas, weekday dinners, or beer-swilling revelry, the seating you choose gives your outdoor space purpose, so comfort and function are key. We love how Vintage Revival has styled her Tavola table with statement-black Svelti chairs. Historically, using outdoor furniture as indoor furniture was a no-no. Mainly because flimsy plastic resin doesn’t go well with … anything. But today, outdoor furniture can be as beautiful and modern as indoor furniture. We’ve got lots of options that work as well on your deck as they do your dining room table. Out with the patio. In with the outdoor living space. Not quite there yet? Don’t feel like you need to invest all at once. Most outdoor living spaces aren’t built in a day. With a little care and attention, you can curate a cohesive space that you build over a few summers.